Combination of two materials and two styles : a metal wire structure covered with 494 white pearls ... combination of glamour and industrial, cold metal and smooth pearly beads. A girly armchair, the River pearl of your home. 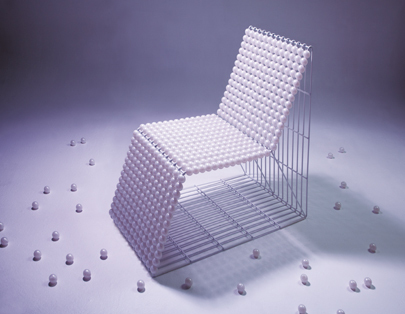 This armchair attracts the hand, the beads roll under your fingers, it is a flowing dress at the foot of the one that sits. Height 88 cm (34.64’’), Width 48 cm (18.89’’), Lenght 81.5 cm (32.08’’), seat 42 cm (16.53’’), Weight approx. 25 kg (55.115 lb). White metal wire structure (epoxy paint). Supplied with 5 spare beads.